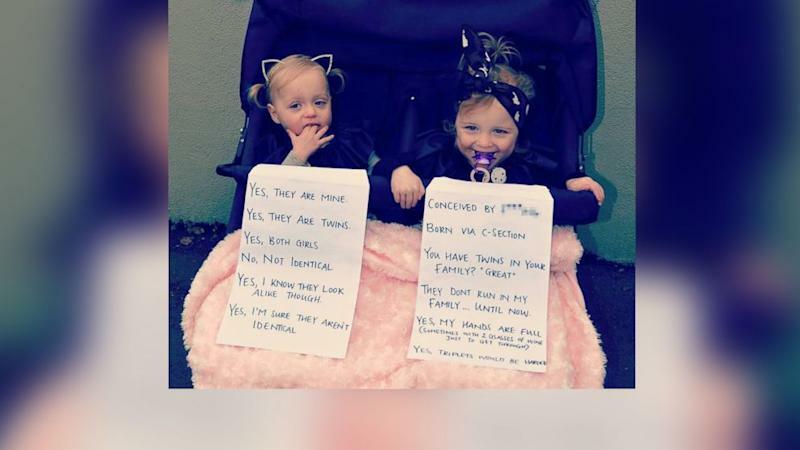 An Australian mother has been under fire since sharing a staged photo online of her twin daughters wearing snarky signs bearing the answers to what she said are questions strangers ask frequently about her twin daughters. "I have had the general dribble of trolls which I take with a grain of salt," Annie Nolan of Melbourne, Australia told ABC News. "However, it was mostly about the swear word on the sign, and also that I am ungrateful that I have children, and I am rude for not wanting to talk to people. "And I absolutely never meant to hurt a single soul with this photo." Nolan, a mom of three, said she and her sister made the signs in response to being stopped by strangers on the street who ask her personal questions about being a mother to twins. When the questions became too forward or repetitive, Nolan said she posted a photo of two-year-olds Delphine and Cheska with the signs as a harmless joke on her blog's Facebook page. "For some reason twins can open the flood gates for not only a lot of questions, which are generally very nice and I am more than happy to answer, but every now and then some rude ones," Nolan said. "I have had someone ask if they were identical and when I said that there weren't, they took a closer look and said 'I can tell because one is better looking, so which one is smarter?'" "It was mostly to gain a laugh between my friends who have twins," Nolan said. "The sign was meant to be received like 'Wouldn't this just make life easier?'" Also, if I had of known it was going to be this big, I wouldn't have sworn. It was my way of expressing my frustration with the 'Are they natural?' question. It is as if to say that there is something unnatural about IVF-conceived children. When my girls were in intensive care you have no idea how hard I prayed and I don't consider myself particularly religious. So, the comments made by people who can't conceive a child or have lost a child telling me I should 'be happy that I even have kids' really affected me." "I really am sorry to anyone that was offended by this in that way." Nolan said while she still regrets adding profanity to one of the signs, she hopes some people were able to find laughter from the photo.